Yellow-bellied sliders (Trachemys scripta scripta) are freshwater turtles that come from the United States, specifically the nation's southeastern region. Out in nature, they are prevalent in states such as Virginia, Georgia, Florida, North Carolina, South Carolina and Alabama. Yellow-bellied sliders also make common household pets. They are part of the family Emydidae. Yellow-bellied sliders, in line with their handles, do indeed possess yellow tummies. Most of their body coloration, however, is yellowish-green or brown. Their upper shells generally are between 5 and 8 inches in length, although they can, in rare circumstances, grow to a maximum of a foot. Their yellow lower bodies are often adorned with dark, circular smears, although not in 100 percent of specimens. 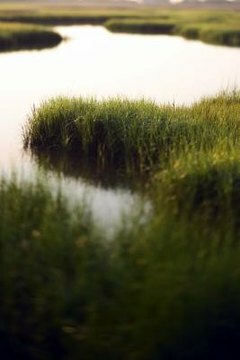 In terms of living environment, wild specimens typically reside in marshes, ponds, creeks, ditches and lakes. Mature yellow-bellied sliders consume omnivorous diets -- a mixture of plants and meat. Despite that, they lean heavily toward plant-based foods. In youth, they tend to be a lot bigger on flesh-eating. Some nutritional staples of the species are fish, tadpoles, spiders, snails, bugs and crayfish. Water bugs are a major dietary preference for these sliders, such as the larvae of dragonflies. They occasionally feed on the dead carcasses of other animals -- carrion. As far as plants go, yellow-bellied sliders frequently go for seeds, foliage, algae, roots and stems. In captive environments as pets, yellow-bellied sliders typically do well on commercial pellets designed for turtles. They also appreciate diced fresh veggies and fruits. Lettuce in particular is a common food item for yellow-bellied sliders. Cut-up bits of meat, including seafood like shrimp, are also usually beneficial for these turtles. You can also offer your yellow-bellied pet "once in a while" snacks -- think waxworms and mealworms. Diversity is key for their diets. If you're ever uncertain about the suitability of any food with regard to your slider, speak to an exotic veterinarian before ever feeding it. Be extremely careful when giving your pet yellow-bellied turtle his meals. If you employ your hands for these purposes, your puzzled pet could assume they're food and bite them -- ouch. Avoid this uncomfortable scenario by investing in some tongs. Your hands will probably thank you for it later.